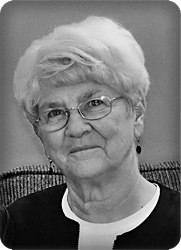 Joyce Koning (Geelhoed, Meines) (1/08/1938–6/27/2018) of Byron Center, was embraced by her Lord and Savior as she entered heaven on Wednesday, June 27, 2018. "I delight greatly in the Lord; my soul rejoices in my God. For he has clothed me with garments of salvation and arrayed me in a robe of his righteousness" (Isaiah 61:10a). Joyce shared her love for God with others in everyday activities, including volunteering at the Bibles for Missions thrift store and the Cleft Palate clinic, giving gifts of cookies and soup, and offering words of encouragement through cards. Joyce began each day with God in prayer for her children, grandchildren, and countless others as God placed them on her heart. Joyce was preceded in death by her first husband and father of her children, Jim Meines; second husband, Rhyne Koning; parents, Jacob and Grace Geelhoed; and sister, Sadie, and brother, Donald. Her legacy lives on with her children and grandchildren: Barb and Rick Lutke (Sarah and Nathan Ostema), Sandy and Tom Groen (Liz and David Brand, Amy and Kyle Cain), Ken and Sherri Meines (Stephanie, Steven, Kristyn, Jon and Carrie), and Doug and Jill Meines (Mitchell, Abigail, Aaron and Bryanne); stepchildren, Renee and John Vander Wilp, Ed and Kim Koning, Ruth and Ron Koning, Carol Mayne, Mary and Scott Froehlke; as well as 15 step grandchildren and 17 step great-grandchildren; brother, Ken and Kathy Geelhoed; sisters-in-law, Betty Geelhoed, Jean Meines, and Mary Baker; along with many nieces, nephews, and cousins. As a family, we would like to thank her treasured friends and church family for walking this road with us as you offered your love, support, and continued prayers in the ups and downs over the last several months. We also thank the staff at Trillium Woods for their excellent, compassionate care while sharing the love of Christ with Joyce and her family. Visitation will be Friday, June 29, from 1-3 and 6-8 p.m. and a celebration of life service will take place at 11 a.m. on Saturday, June 30, both at Trinity United Reformed Church, 7350 Kalamazoo Ave SE. There will be visitation prior to the service from 10 - 10:45 am at the church. For those who are unable to attend the service, live streaming will be available at www.trinityurc.net by clicking on "webcast" on the home page. Burial will be at Woodlawn Cemetery. Donations in lieu of flowers may be made to the Bible League, World Vision, or Trillium Woods. We were saddened to read of the passing of your Mother. She was a Faithful, loving, caring lady, who always put her family first. We were so happy to have shared a summer vacation with their family years ago. Sending our sincere condolences to each and every one of you; she was always so proud of her family.